Dewatering fine sand recycling machine is also called NO.6 fine sand recycling machine. It is a new type and hot sale machine in LZZG, based on the original dewatering screenl, the function of material recovery has been added to achieve a multi-purpose effect. And It is a new type of fine sand recovery device integrating material dewatering and recycling, and is also the latest type of environmental sand washing equipment. What’s more, it is widely used in the Coal mine plant, gravel factory, metal factory, wastewater treatment plant and stone factory. In recent years, with the improvement of national environmental awareness, the demand for fine sand recycling machines has gradually increased in the sand and gravel industry. 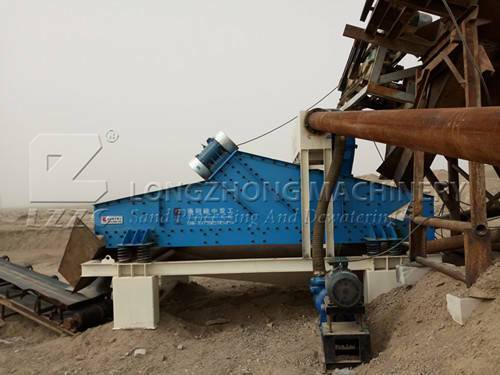 Longzhong Zhong work has become the largest production base for fine sand recycling machines in the country. In order to meet various needs of customers, the sand recycling machine Based on the new improvements, we have developed the sixth generation of sand recycling machines with stronger dewatering capabilities. The dewatering fine sand recovery machine is generally used in the wet sand-making production line, and is directly installed in the rear of the sand washer. The dewatering screen on the equipment performs further dehydration on the finished material of the sand washer.The recycling system on the equipment recovers the waste discharged from the sand washing machine, which fully solves the drawbacks of the sand washing machine (for example, the finished product has a large amount of water, a large amount of mud, a lot of dust, impurities are difficult to remove, etc. ), and greatly improves the Finished product quality. Since this kind of machine launched in the mnarket, it has arounsed profound influence, many regular customers are eagerly to know its functions and performances, and want to know about how about its price and quality. Our company has always adhered to the goal of “for all alients”. Of course, our product will be attractive and reasonable price, and we can give you a promise that if you find this machine is not meet your needs after operating a period, you can consult us within 24 hours.